At Turbary Woods we offer an experience you will never forget. Do you want to get a little closer and hands on with our birds? 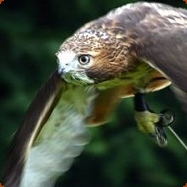 The course we offer is not simply a falconry lesson or display where we talk to you for a while. Please Note: Our Handling courses are only available during the week days. And not during school holidays. Turbary Woods is Sponsored by Marshall Radio Telemetry, HW Chartered Accountants, Price 4 Print, Glasdon, West Weald Falconry, Etruk and The Pen Warehouse. Turbary Woods Owl And Bird Sanctuary Preston Lancashire: Opening Times and Admission Prices. You can contribute to the running of Turbary Woods Owl and Bird of Prey Sanctuary, Lancashire, by making a donation. Turbary Woods Owl And Bird Sanctuary Preston Lancashire: Certificate of Sponsorship.